The Snakefighter, aka "Snakes on a Firetruck" | OhGizmo! While Snakes on a Plane not only sounds like a bad idea but also happens to be shaping up to be a box office flop, Snakes on a Firetruck is a different story altogether (it’s a bad pun, in case you’re not catching my drift). 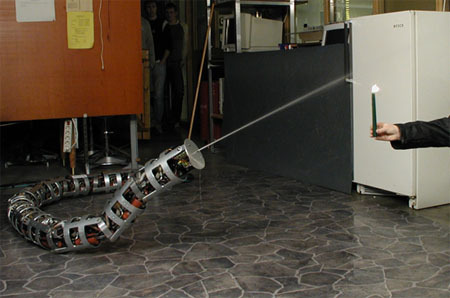 In 2003, some researchers at SINTEF began a project called “Snakefighter”, which sought to develop a self-propelled snakelike robot with the ability to shoot water. This would evidently allow it to extinguish some fires that would otherwise be too dangerous for human firefighters to get close to. The ingenious aspect with this idea is that the energy the system needs in order to move is already available inside the fire hose, which contains water pressurized to 100 bar. The advantage of serpentine locomotion instead of wheel- or leg-based propulsion is greater flexibility and traversability. SINTEF now has developed a prototype, which is 3m long and weighs 70 kg. The water hydraulic actuators give the robot enormous power. It moves like a biological snake and can raise its head above the ground to spray water. It is however at the moment only used as proof of concept, and there seems to be no concrete plans for commercialization.